Are you heading to Paris over the next few months? Lots of my friends seem to be heading to this gorgeous city and have asked for some suggestions about things to do other than the ‘big iconic sights’. It always seems best , to me, to spend as much time in one city as you can than to jump around and Paris is no exception. Stay as long as you can, to discover the side of Paris most people miss. As you probably know Paris is divided into Arondissemnts – a bit like suburbs, but given a number. It also has the Seine to divide it into Left Bank and Right Bank. So depending on where you stay you can explore Paris yourself, mostly on foot, and discover so much as you go. 1. Choose the Arondissement you wish to stay in. I have stayed both Left and Right bank and love the 4th or lower Marais ( and the 3rd or upper Marais) A very close second is 6th into the 7th. Not the touristy end of St Michel and Saint Germaine. 2. Do see the ‘ big sights’ this means : The Eiffel Tower , the Louve, Musee D’Orsay, the Tulleries. However it’s best to incorporate them into your general wandering in Paris. 4. Plan your days – this can include wandering the Arondissements but with an end in mind. A few of my Favourite Things: which Arondissement to stay and play? 1. 4th Arondissement: Marais. It’s narrow streets hint at its medieval background and give it an intimate feel. It’s full of artisans and craftsmen and lots of lovely boutiques. It’s also open Sunday when other areas are all closed. So plan this area on a Sunday. The wonderful Carnavalet Museum which is housed in a building of such beauty with secret gardens it has you feeling you are away from the crowds. It tell of the history of Paris. Place de Voges a wonderful peaceful square to walk or sit in peace and watch the fashionable Parisians. Take a walking tour of the area. Usually around 10euro for about 2-3 hours it is a great way to get the history of the area. 2. The 6th Arondissement: this is an area of such beauty. Grand buildings and tree lined avenues and the fabulous Luxemburg Gardens. I once spent a beautiful, warm, winter November Sunday in the gardens just observing, taking photos and being peaceful. You can settle on one of the thousand green metal chairs and watch chess players, tennis matches, bocce, children riding miniature cars and ponies, families sailing boats on the lake, lovers walking hand in hand, old men chatting, cyclists and coffee drinkers. It’s a snap shot of Paris and costs nothing. Bon Marche a department store to tempt even if it’s just in the food hall. The book stores off Saint Germaine. Including my absolute favourite Shakespeare and Co which is technically in the 5th but definitely worth a visit. The design and decorating stores are great for window shopping, the florists bursting with colour, the fashion boutiques, usually the higher end ones which seem friendlier than their sister shops over in the 8th Arondissement. The tea houses – Laduree for one and cafes made famous by the writers, Cafe de Flore, Deux Magots and the Lipp. Take time to stop and have a drink or coffee. No one will mind if you sit with one drink and observe those passing. Streets to explore:Pace de Furstemberg and the Delacroix Musem. Rue e Buci with all it boutiques and designer stores, Rue Jacob, Rue Saint- Andre des Arts. 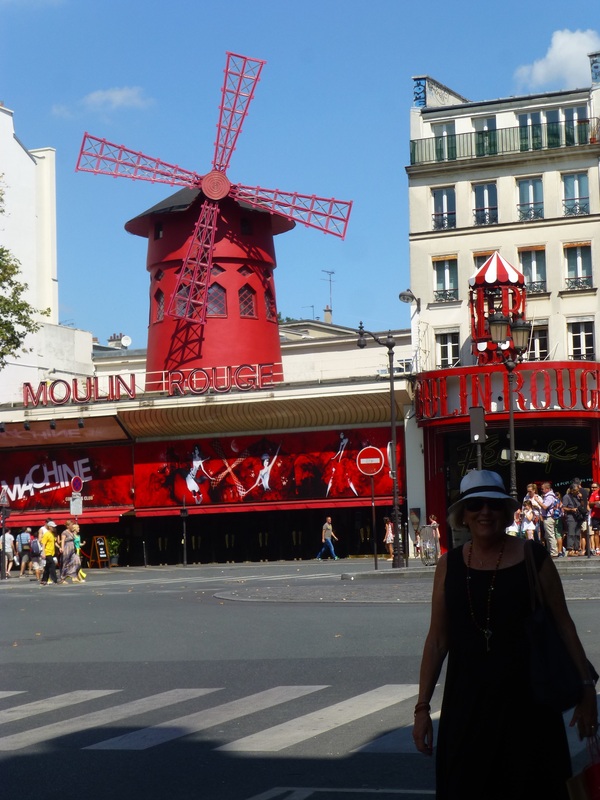 And if you feel like a big walk wander along Rue de Varenne and find the thoughtful Rodin Museum, across past the Invalides and follow Rue Saint Doinique to Parc Champ de Mars and the view to the Eifeel Tower. Then visit it! Make sure you make regular stops for Coffee, ice cream, French Patisserie. I promise you there are lots of places to stop along the way. If you are now exhausted catch the no 69 local bus back. It winds its way back to the 6 th, along the Seine crosses at Pont de Carrousel in front of the Louve then turns right and follows Rue De Rivoli, past the great Musee Palais Royal, the Hotel de Ville through the Marais to Bastille ( visit the New Opera House). It continues all the way to the Pere Lachaise Cemetry where you can easily wander or take a tour of all the famous people buried here. What value for money! I’ve taken this bus many times. It’s slower than the metro but it passes so many places of interest and you can easily hop on and off with the price of a ticket that lasts 2 hours. A Few More Favourite Things! Jacquemart-Andre Museum on Boulevard Haussmann in the 8th. A beautifully decorated mansion house with a fabulous tea house for lunch. Museum of Decorative Arts: a treasure trove of things artistic. Palais du Louve Rue de Rivoli in the 1st. Visit at least one tea salon: Laduree in Ave Champs Élysées in the 8th, Mariage Freres in Rue Bourg- Tibourg in the 4th or Angelina in Rue Rivoli in the 1st. In fact read my blog from my two week stay in Paris in October. 2012. Search Paris. Oh belle Paree, how I miss you and cannot wait to go back. We enjoyed staying in the 11th on our last visit and like you prefer to stay away from the very touristy areas. Fran reading this reminded me how much I love Paris . I agree with you, the Matais is a beautiful place to stay. Geoff and I need to go back and I will certainly be using you blog for a guide- thank you! We were going in July/August to visit Stuart’s son who has been working there for a few years but he has transferred within the company back to Sydney & arrives back on Anzac Day so there goes that holiday!